Paint the Town and Arts Unleashed! WOW! If you only come to Annapolis Royal one weekend this year, this is the one! This weekend kicks off an eight-day arts festival called “Arts Unleashed!” from August 17-25. 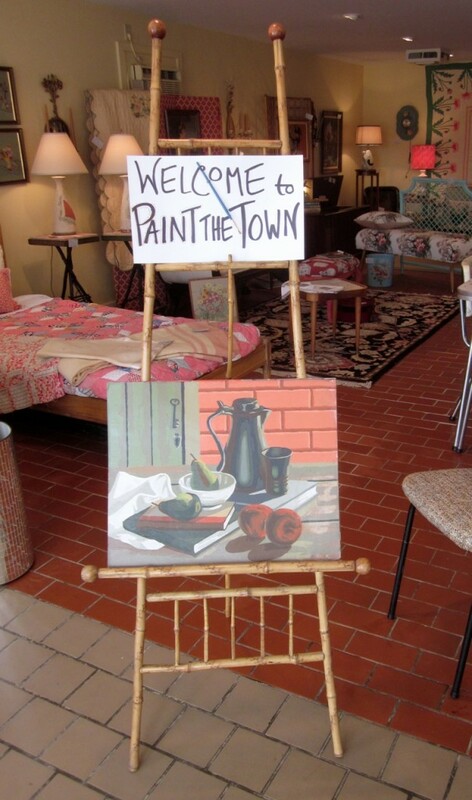 It begins with our famous Paint the Town weekend. Artists from all over come and paint our town. Runners pick up their finished paintings and set them up at the Legion where you can bid – until 5 pm – on your favourite piece. And it all begins again on the Sunday. From then on, every day till the 25th, there are events. Here at Mrs. Nicholson Home we are putting on three! On Wednesday the 21st at 2 pm, Jane will give a talk on vintage fabric design showcasing some barkcloth pieces and tablecloths and explaining how economics impacted fabric design. On Thursday the 22nd at 11:30, our florist, Lorraine Beswick, will demonstrate how she puts together a bouquet. On Friday the 23rd at 2 pm, I will give a demonstration of needlepoint techniques and you can try your hand at a few stitches. We have quite a few lovely vintage needlepoints in the store and needlepoint is still a wonderful, relaxing hobby. The festival ends with an amazing show at King’s Theatre called “Dancing in the Third Act” which features 12 seniors and a celebrated choreographer, Randy Glynn. This show will be at King’s on the 23rd, 24th and 25th. The weather is going to be perfect and the Town is ready to host you!